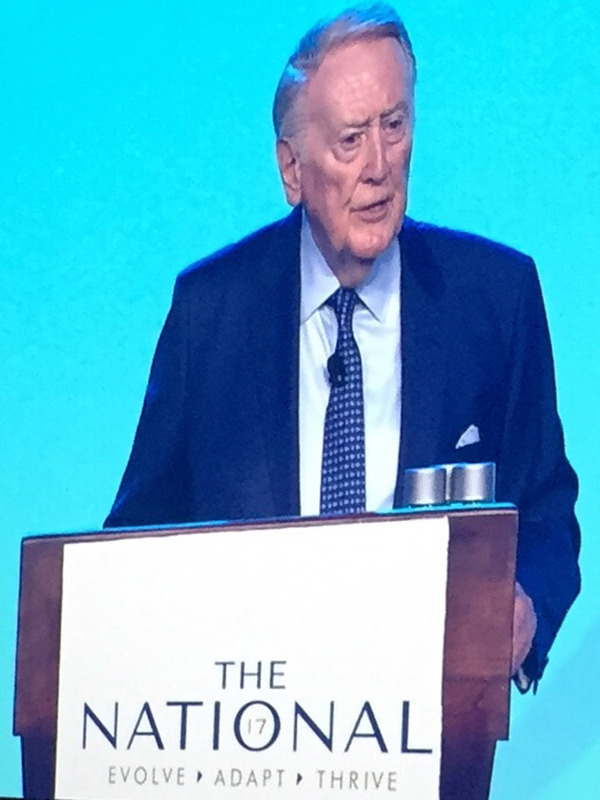 Before 2,000 financial advisors in Nashville this week, Vin Scully opened with his signature introduction to wish everyone a "pleasant good morning" and to let them know that "it's time for Dodger baseball." And the lyrically descriptive style and sweet-sounding voice that millions of Americans have loved over the last 68 years of a truly iconic broadcasting career didn't disappoint. Vin was at his storytelling best on this day, and attendees were hanging on every word. Two standing ovations in fact. He's the ultimate employee to talk on Loyalty to an Organization; Vin started his illustrious career with The Brooklyn Dodgers in 1950 and retired last year after 68 seasons in the broadcast booth. This was in fact the first opportunity that Vin has had to actually travel outside of Southern California for a speaking engagement. And with stories that hit chords with old and young alike in this audience, we can tell there'll be more dates to come - and soon. I had the opportunity to travel with Vin Scully to Opryland this week, and I feel privileged and honored to have spent some time with this kind, caring, and truly special American Legend of sport. We're excited to check Vin Scully's 2018 calendar for your next meeting or convention! Danny Meyer on 60 Minutes!